Coming into the season, Hill-Murray was a team trying to find its identity. 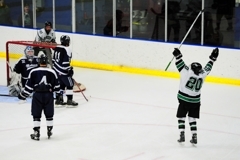 From last year's team, it lost four players that recorded 30 points or more, All-State goaltender Tim Shaughnessy and talented defensemen that helped win the Classic Subruban Conference championship and a No. 1 seed in the section playoffs. 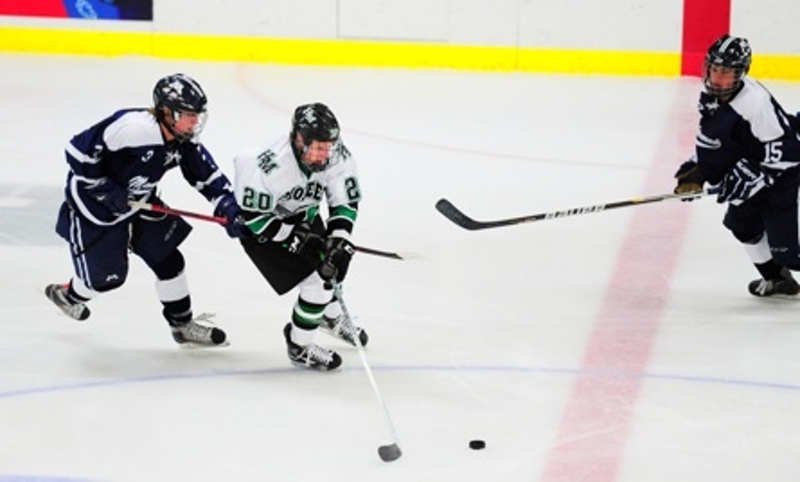 With losses to Benilde-St. Margaret's and Burnsville to open the season, Hill-Murray has bounced back to win three straight games, only allowing two goals in that span. The most recent win was a 3-1 victory against No. 10-ranked (Class A) Mahtomedi on Thursday, Dec. 15, a Classic Suburban rival that is off to a hot start. 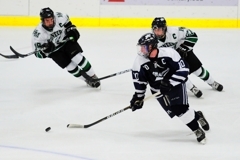 In order for Hill-Murray to stop Mahtomedi, it had to contain the Zephyrs top line of Johno May, Patrick Kegley and Tanner Jordan, a trio that combined for nine points in their most recent game against Cretin-Derham Hall. Other than a few chances in the first, the Pioneers closed the door on the Zephyrs scoring threats with team defense and another solid performance in net by John Dugas. "We have been playing great in our own zone," Pioneers forward Jake Guentzel said. "Our team defense has been good and it's given us a chance to win games. "Johnny (Dugas) has been great in goal, too." Against Mahtomedi, the Pioneers had to keep up its tight defense, because the Zephyrs came in averaging 5.2 goals-a-game. "This was a huge confidence booster," Dugas said. "You look at the crowd they had, you know that's a good team, so we had to play good defense and I think this gives them a lot of confidence." After the Zephyrs had an initial push to start the game, Hill-Murray was able to limit chances once it got the lead. 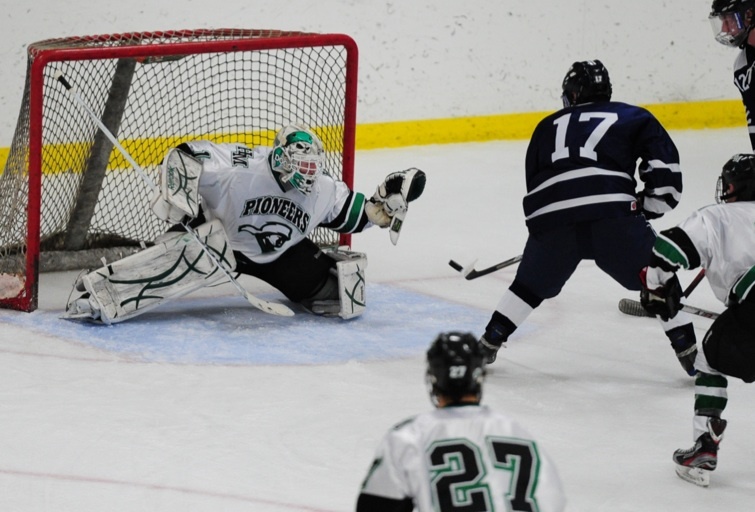 When Charlie Sampair scored in the first to put the Pioneers up 1-0, it allowed Hill-Murray to play its game. "That first goal was big,"Pioneers coach Bill Lechner said. "It was a close game for a while and we needed it." Even strength, Hill-Murray had the upper had, but even when it had to kill of all five Zephyr power-plays, there was not many scoring threats produced by Mahtomedi. 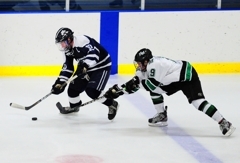 Two nights earlier, the Zephyrs were able to set up their power-play to near perfection, allowing skilled players to roam the ice and find open space to get in position to score. This was different against the Pioneers, which had an aggressive penalty kill that forced Mahtomedi to make quick decisions, often times leading to errant passes and a lack of scoring chances. "We were good on the kill," Lechner said. "That was definitely a positive." For a team that may still be trying to determine what it wants to be, it proved it can withstand a first-round punch, get up and dust itself off as it did against St. Thomas Academy. On Thursday, it displayed a defensive effort that took the steam out from a high-scoring team that has found the back of the net at least four goals in each game coming in. Hill-Murray forced a confident team to stray away from what produced four consecutive wins and eventually, those problems trickled down for the Zephyrs. "I think our guys got a little frustrated and went away from our gameplan," Mahtomedi coach Jeff Poeschl said. Currently displaying youth on the blue line, but is backed up with strong goaltending and a concept of taking care of its own zone, the Pioneers may have found out that they are a team that can suffocate its opposition and shut them down on the scoreboard. "I think our defense is a strength," Pioneers defenseman Blake Heinrich said. "We have a great goalie, our defense, even though they are young, are stepping up and playing good and our forwards are back there helping us out, too." One of the offensive scoring threats this season for Hill-Murray was supposed to be Jake Guentzel. 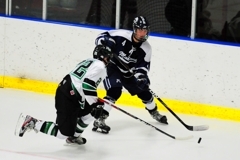 He has answered with six points in four games coming into the Pioneers Classic Suburban showdown with Mahtomedi. In the third period, he got the monkey off his back when he scored on a wraparound attempt, beating Mahtomedi goalie Sawyer Marshall to the right post. "It was nice to finally get one," Guentzel said. Guentzel's six assist had him on top of the scoring sheet for Hill-Murray and his one goal, two assist effort will keep him there. His goal totals this season has been the brunt of some friendly jabs at one of the most gifted offensive threats the Pioneers have. "We tell him he's all about the assists and doesn't want the goals," Pioneers goalie John Dugas said. "A lot of times we have to tell him that he is too friendly out there, so it is nice to rip into him a bit. "He's a great player and he was big for us tonight and we need him to play like he has been doing for us lately." Late in the first period, Mahtomedi forward Tanner Jordan had the puck at the Pioneers' blue line and made a quick cut to the middle of the ice for one last rush before to tie the game before the first 17 minutes of play ended. He did not get much further because Hill-Murray defenseman Blake Heinrich was waiting, lined him up and delivered a thunderous open-ice body check that not only got the attention of Jordan, but drew an echoing reaction from all who were in attendance at Aldrich Arena. "That is Blake (Heinrich), so I am not surprised," Dugas said. "He makes hits like that all the time, so we are used to seeing him do that." Hill-Murray might be regarded as a team that has the highly-skilled goal scorers and play-makers, but Heinrich has added some grit to the Pioneers. "I like to play the body and make hits," he said. "I love it when guys cut back to the middle, because you can get them like that." With the score 1-0 in the first period, in the Pioneers favor, the still could have gone to either team. 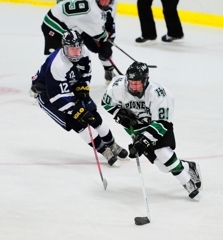 However, Heinrich's hit late in the first period set the tone for Hill-Murray, which ended up locking down its defense and forced the Zephyrs to be a little more careful when they were going through the neutral zone and into the Pioneers zone. "You could see they might have been a little intimidated after that hit," Dugas said, who had a good view from the Pioneers net. "Mahtomedi has some talented players and that kid (Jordan) had a great first period, but we seemed to play a lot better after Blake made that hit on him." "That gave us some momentum," Guentzel said. "But he does that all the time, so we weren't surprised either. It was a big hit and we played pretty good after it." 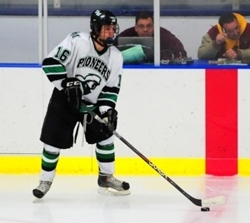 Jake Guentzel scored a goal and chipped in with two assists, having his hands in all three of Hill-Murray's goals as the Pioneers defeated No. 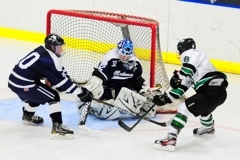 10 (Class A) Mahtomedi 3-1 on Thursday, Dec. 15 at Aldrich Arena. Charlie Sampair scored the first goal of the game midway through the opening period when his wrist shot along the ice was able to get by Mahtomedi goalie Sawyer Marshall. In the second period, Guentzel set up Sam Becker in the slot, who was able to one-time his shot past Marshall to give Hill-Murray a 2-0 lead. Guentzel was able to score his first goal of the season in the third period, when his wraparound on the power-play got by Marshall to extend an already daunting lead to 3-0. The Zephyrs got on the board with just over a minute to play when Jake Albin slipped a shot by Pioneers goalie John Dugas. In net, Dugas was solid once again, even though he battled the flu. He made 22 saves for his second consecutive win against top 10 opponents, which are also Classic Suburban Conference schools. Marshall was a bit more busy, having to make 30 saves to keep the Zephyrs in the game. Hill-Murray improves to 3-2-0 (3-0-0 Classic Suburban) and will stay at home to host Wayzata on Saturday, Dec. 17 at Aldrich Arena. Mahtomedi suffers its first loss since the season open and drop to 4-2-0 (2-1-0 Classic Suburban). It will go return home to play North St. Paul on Saturday, Dec. 17 at the St. Croix Valley Recreation Center. In the third period, Guentzel recorded his first goal of the season and third point in the game, when his wraparound attempt beat Zephyrs goalie Sawyer Marshall. Guentzel had his hand in every Pioneers goal, assisting on Andy Faust's first period goal and Sam Becker's goal in the second period. For the season, Guentzel has nine points. Even though he was not as busy as he was in his last start, Dugas had to be sharp in the first period, when Mahtomedi had its best scoring chances. On top of that, Dugas has been fighting the flu, so his status coming in was questionable, but he got through it with a solid performance, stopping 22 shots. 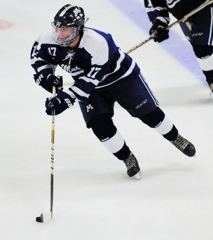 Late in the first period, Heinrich delivered a bone-crushing hit at the Pioneers blue line that drew an enormous reaction from everyone in attendance. Mahtomedi's Tanner Jordan tried to cut to the middle, but Heinrich met him with a huge, clean, open-ice hit. His physical play throughout, mixed in with his defensive play kept the Zephyrs powerful top line from generating much offense.